‘Body positivity’. Two words, ingrained deep in our collective consciousness, and which seem wholly and irrevocably linked to Instagrammable quotes and influencers eating donuts. It is a movement that crept up on us, becoming one of the largest and most recognisable forms of social activism. Somewhere along the line, while we were trying to get the perfect shot of our Dr Martens and cut-off Levi’s, writing Tumblr poetry (I still wake up in cold sweats thinking about my teenage Tumblr account) and eating avocado on toast; body positivity became the thing to focus on. Body positivity is arguably more necessary than ever. For all the benefits of modern technology, there are the sinister downsides of Photoshop, of airbrushing, and the creation of a platform by which an innumerable amount of vulnerable people can be reached in mere minutes. The Internet allows us to connect in a way that is almost entirely without boundaries, but it also makes us vulnerable. Quite simply, it leaves us open to fiction framed as reality. Anyone who is guilty of posting a pre-prepared selfie or an idealised brunch shot - when in actual fact they are sickeningly hungover, gorging on takeaway food and ugly crying at a Netflix Original - is acutely aware of how easy it is to lie on social media. It is this endless charade which makes body positivity all the more important. Figures published by The Health and Care Information Centre estimate that the prevalence of Eating Disorders is rising at a rate of up to 7% per year. Simple calculations put that at an increase of over 87,000 people in the UK alone. We have never been more uncomfortable in our physical frames. Particularly now, as the New Year begins, and various forgotten celebrities defrost their razor-sharp abs and prepare to promote a weight-loss DVD, it would be a welcome respite to see anything that allows us to look down at a post-Christmas stomach and feel anything other than inadequate. Enter I-Weigh. In the world of body positivity, it is a relative new kid on the block. 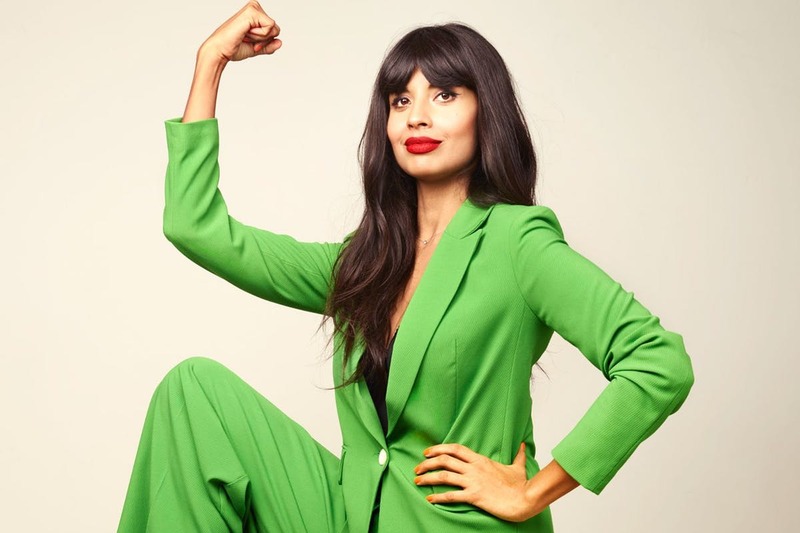 The brainchild of actress, presenter and self-proclaimed ‘Feminist-in-Progress,’ Jameela Jamil, I-Weigh is a body positive Instagram account with a difference, and one which threatens to challenge our perception of what it really means to be ‘body positive’. I-Weigh began in response to an Instagram account that posted a picture of the Kardashian-Jenner sisters, labelling - and consequently comparing them - solely by their weight. The idea that any human being should be reduced to a mere number on a scale is frightening, and when it is broadcast to hundreds of thousands of people, it quite frankly becomes dangerous. And so, Jamil decided to instigate change. Since its creation, I-Weigh has amassed 270,000 followers. It is comprised of over 2,000 individual posts, and encourages followers to see beyond the number on the scale, to embrace themselves as they are, and to celebrate their differences. Its popularity is a credit to Jamil’s tireless promotion and advocacy. So far, so recognisable. But I-Weigh is different, because I-Weigh has no physical or bodily focus at all. The premise is simple. Post a picture of yourself, and, much like the infamous Kardashian picture, label yourself. Tell the world what you weigh, but do so not in numbers. Do so in terms of your achievements, your character and your flaws. Tell the world that you are the weight of your fiery nature, your ardent love for dad jokes or your inexplicable fear of Clifford the Big Red Dog. Tell the world your weight is measurable by the degree you love and the words of your favourite books. Hell, tell the world that part of what you weigh on this earth is your incessant ability to be late for absolutely everything (apologies to my long-suffering friends.) The concept is so startlingly obvious that it seems ridiculous to believe that it has not been done before. Since the explosion of social media, there have been countless body positive accounts, and each is vital in the continual fight against body-shaming, airbrushing and diet culture. Movements such as #embracethesquish, #donthatetheshake, and the indelible light that is @bodyposipanda have been, and continue to be, an inspiration to anyone who has struggled with the societal pressure to possess a ‘perfect’ body – really, to anyone who has a body and hasn’t managed to acquire a superhuman ability to deflect any and all negative influences. The research done for this piece, and the hours spent looking through endless body positive posts have truthfully been among the most uplifting time I’ve ever spent on social media, succeeded only by pictures of dogs and a video of a bird dancing to The Beach Boys. These accounts are unquestionably important. But I-Weigh truly feels like the catalyst for a pivotal shift in the world of body positivity. It aims to move the emphasis away from the body entirely, and to take away the obsession with physical form is to cut the problem at its core. I-Weigh, in ignoring this physicality altogether, allows for a level of freedom and inclusivity that historically, no other movement has been able to offer. To reduce a soul to a succession of numbers on a scale is to reduce all the world’s literature to one word. But to concentrate our focus merely on our physical bodies would be to choose only one author, and one book to consume over and over again. To look at thousands of years of music, and choose to listen only to one song. It is estimated that Shakespeare alone produced over 30 plays, and over 150 sonnets. Mozart composed over 600 pieces. I-Weigh allows us to look at ourselves and read everything, to eavesdrop on the whole range, including the flaws; and it encourages us relish each crescendo, and celebrate every last word.